(1945) – Pfc. 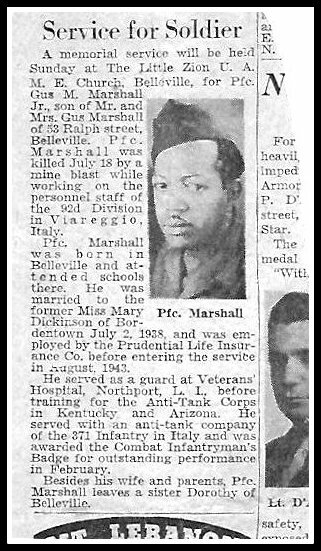 Gus M. Marshall Jr., son of Mr. and Mrs. Gus Marshall of 53 Ralph Street, Belleville, N.J., was killed July 8, 1944, by a mine blast while working on the personnel staff of the 92nd Infantry Division in Viareggio, Italy. Marshall was attached to the headquarters station when the mines stored in an adjacent building exploded. Marshall was in the Army two years, and went overseas in October. He served as a guard at Veterans' Hospital, Northport, L.I., before training for the Anti-Tank Corps in Kentucky and Arizona. He served with an anti-tank company of the 371st Infantry in Italy and was awarded the Combat Infantryman's Badge for outstanding performance in February. Marshall was born in Belleville and attended schools there. He was married to the former Mary Dickinson of Bordentown July 2, 1938, and was employed by Prudential Life Insurance Co. before entering the service in August 1943. A memorial service for Pfc. Marshall was held at The Little Zion U. A M E Church, Belleville. Besides his wife, Mary, and parents, Gussie and Alma, Pfc. Marshall leaves two sisters, Dorothy and Eunice, of Belleville. Pfc. 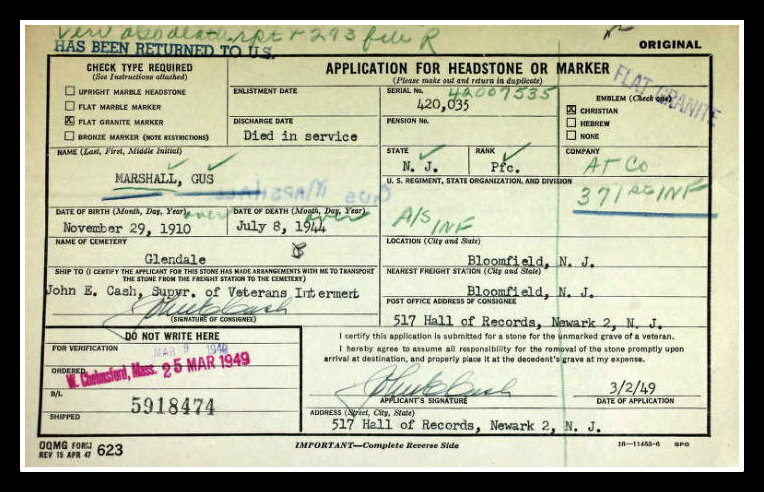 Marshall is buried in Laurel section, NW, Grave 1, at Glendale Cemetery, Bloomfield, N.J. The Veterans of Foreign Wars commemorated the Brown-Marshall VFW Post 8865 at 82 Broad Street, Bloomfield in honor of [John] Gus M. Marshall Jr. and Alvin Brown. Private Brown was killed in action while serving with the same outfit in April 1945. He had previously served six years in the National Guard before entering the Army. Historical Society of Bloomfield, N.J., Anne Carlino, Jean Kuras, Rich Rockwell. Veterans of Foreign Wars of the United States: Charles Lawton, Coordinator, Administrative Operations; Tina Clark, VFW Magazine; Allen Garth, CDR, VFW Post 711. According to the undated/unidentified newspaper clipping supplied (April 2018) by Pfc. Marshall's niece, the earlier published information is incorrect. BellevilleSons.com © 2003-2018 By Anthony Buccino.